ROSLANE MEDITECH are eminent Indian Exporters of various types of Diagnostic Sets. 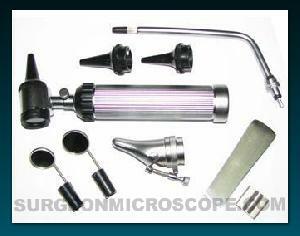 offers, various models of Export Quality Diagnostic Sets, at most affordable price, as per the buyer�s need. One Halogen Otoscope Head with Reusable Ear Specula 3mm & 4mm, One Spreadable Nasal Speculum, One Bent Arm Illuminator, 2 Laryngeal Mirross 4 No. & 5 No., One Tongue Depressor, One Tongue Depressor Holder One "C" cell Dry Battery Handle .